A window of opportunity may be opening to secure sustainable financing – from an unusual source – to support national, state, and provincial-level efforts to Reduce Emissions from Deforestation and forest Degradation (REDD+). The global airline industry is seeking international agreement on a program to cap the carbon dioxide emissions of flights between countries, and let airlines use a Market-Based Measure (MBM) to offset emissions above the cap. When the 191 governments that comprise the UN’s International Civil Aviation Organization (ICAO) vote on the MBM at the end of September, that may decide whether airlines can use REDD+ to offset their emissions above 2020 levels. Why does ICAO need REDD+? In 2013, ICAO member states adopted a goal of “carbon neutral growth from 2020” – i.e., capping the net emissions of international flights at 2020 levels. International aviation’s emissions, however, are forecasted to rise dramatically, as tens of thousands of new large aircraft take to the skies in coming decades. 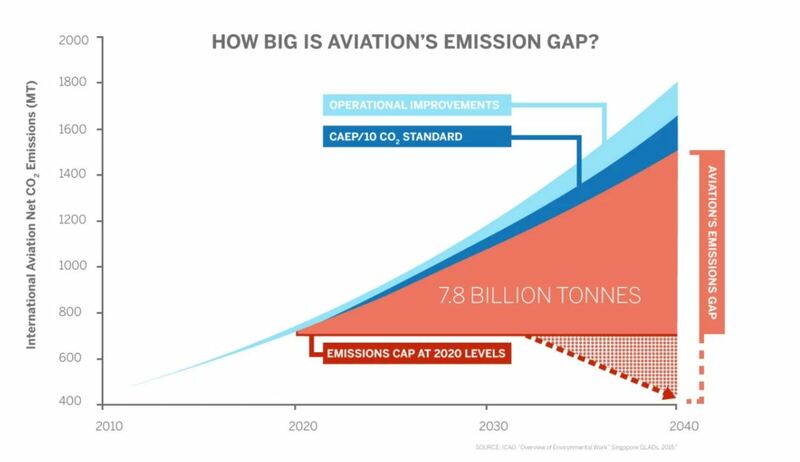 Even after international aviation makes improvements in operational and technological efficiency, the sector will still likely face an “emissions gap” of 7.8 billion tonnes (or 7.8 Gt CO2) over the period of 2020-2040. National and jurisdictional level REDD+ projects that meet the environmental and social safeguards agreed under the United Nations Framework Convention on Climate Change (UNFCCC) are anticipated to be able to supply offsets enabling aviation to cover a significant portion of the expected gap, even while ensuring that these reductions are not also claimed against national emission reduction commitments. The December 2015 Paris Agreement on climate change, adopted by the 197 Parties to the UNFCCC, gave special recognition to the key role that REDD+ can play in mitigating climate change. The Paris Agreement, the UNFCCC’s 2013 Warsaw Framework on REDD+, and related UNFCCC Decisions provide that REDD+ programs must be created at national, or – temporarily – subnational (e.g. state and province) level. This is important because national and subnational REDD+ programs (collectively known as jurisdictional REDD+ or “JREDD+” programs) can create and enforce policies to address deforestation at a large scale. For example, without jurisdictional REDD+, there’s a risk that forest protection in one project area could displace deforestation to other areas; this is avoided when REDD+ projects are “nested” in a national or jurisdictional-level program. According to guidance by the UNFCCC, JREDD+ programs’ results must be recognized by national REDD+ Focal Points and submitted to the REDD Information hub in order to ensure that emissions reductions are not claimed more than once. In March and April, ICAO convened a set of regional dialogues to give governments, industry, and civil society stakeholders the opportunity to discuss MBM design options and potential sources of offsets. ICAO will convene a high-level ministerial meeting May 11-13 at ICAO headquarters in Montreal, Canada, to review a draft text. Additional meetings will be held throughout the summer and the final, and most important ICAO Assembly, where the MBM will be finalized, is to be held in Montreal from 27 September to 7 October 2016. REDD+ countries interested in sustainable financing for their national and jurisdictional REDD+ programs should be aware of the potential for a new ICAO market based mechanism to provide such financing. In order to seize this opportunity, REDD+ policy makers and aviation counterparts need to collaborate to ensure an ICAO market based mechanism inclusive of REDD+ and with environmental integrity. This entry was posted in Aviation, Deforestation, REDD+. Bookmark the permalink. Trackbacks are closed, but you can post a comment.